Two recent decisions by an Amsterdam court mark a victory in the ongoing fight for worker rights in the 'platform economy'. In two cases brought by the FNV on behalf of workers at the food delivery company Deliveroo, the court ruled on January 15 that the company's delivery couriers are employees, not self-employed contractors. According to the court, Deliveroo's elimination of employment contracts and the legal transformation of couriers to self-employed status last year had not altered the fundamental relationship of authority and dependence: the couriers remained in an employment relationship as defined in Dutch law. The court's conclusion validated the FNV's right to represent the workers, whose Riders Union has been contesting the company's phony 'freelance' scheme through strikes and militant protest actions. 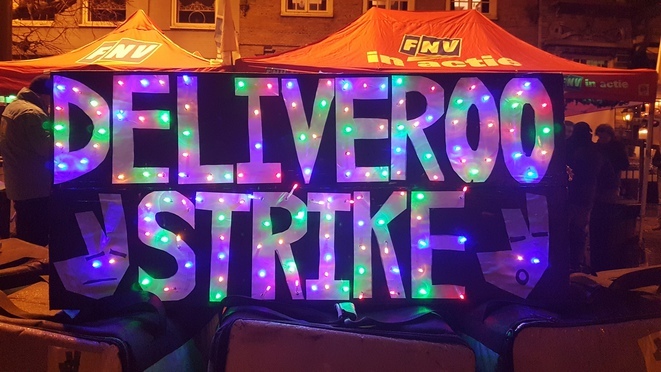 In January an FNV Riders Union solidarity delegation travelled to Belgium to support Deliveroo workers fighting a similar self-employment scam. In a separate decision the same day, the court determined that Deliveroo's activities fell within the scope of the national collective agreement for the goods transport sector, and applied to its delivery couriers. In Germany, the IUF-affiliated food and allied workers' union NGG, which has given strong support to food delivery workers, will hold a second national 'Riders Day' February 7-8.